One of the more colorful episodes in the siege of Petersburg, the Great Beefsteak Raid of September 14-17 helped cement Major General Wade Hampton III as a worthy successor to Jeb Stuart in command of the Army of Northern Virginia. Learning that a large herd of cattle were being grazed by the Union at Edmund Ruffin’s plantation on Coggin’s Point on the James River, Hampton decided to launch a raid behind enemy lines with 3,000 troopers, capture the cattle and drive them back into Confederate lines to feed the Army of Northern Virginia that was on starvation rations. Historians designate nine different offensive operations by the Union during the siege of Petersburg. Although the battles involved in these offensives are unknown except to careful students of the Civil War, they were instrumental cumulatively in making Lee’s position untenable by March 1865 leading to the final military operations of the long struggle between the Army of the Potomac and the Army of Northern Virginia. Sheridan, in his pursuit, got beyond where could hear from him in Washington, and the President became very much frightened about him. He was afraid that the hot pursuit had been a little like that of General Cass was said to have been, in one of our Indian wars, when he was an officer of army. Cass was pursuing the Indians so closely that the first thing he knew he found himself in front, and the Indians pursuing him. The President was afraid that Sheridan had got on the other side of Early and that Early was in behind him. He was afraid that Sheridan was getting so far away that reinforcements would be sent out from Richmond to enable Early to beat him. I replied to the President that I had taken steps to prevent Lee from sending reinforcements to Early, by attacking the former where he was. 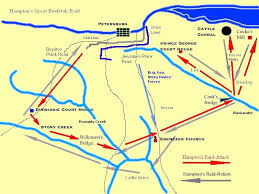 On the 28th of September, to retain Lee in his position, I sent Ord with the 18th corps and Birney with the 10th corps to make an advance on Richmond, to threaten it. Ord moved with the left wing up to Chaffin’s Bluff; Birney with the 10th corps took a road farther north; while Kautz with the cavalry took the Darby road, still farther to the north. They got across the river by the next morning, and made an effort to surprise the enemy. In that, however, they were unsuccessful. The enemy’s lines were very strong and very intricate. Stannard’s division of the 18th corps with General Burnham’s brigade leading, tried an assault against Fort Harrison and captured it with sixteen guns and a good many prisoners. Burnham was killed in the assault. Colonel Stevens who succeeded him was badly wounded; and his successor also fell in the same way. Some works to the right and left were also carried with the guns in them—six in number—and a few more prisoners. 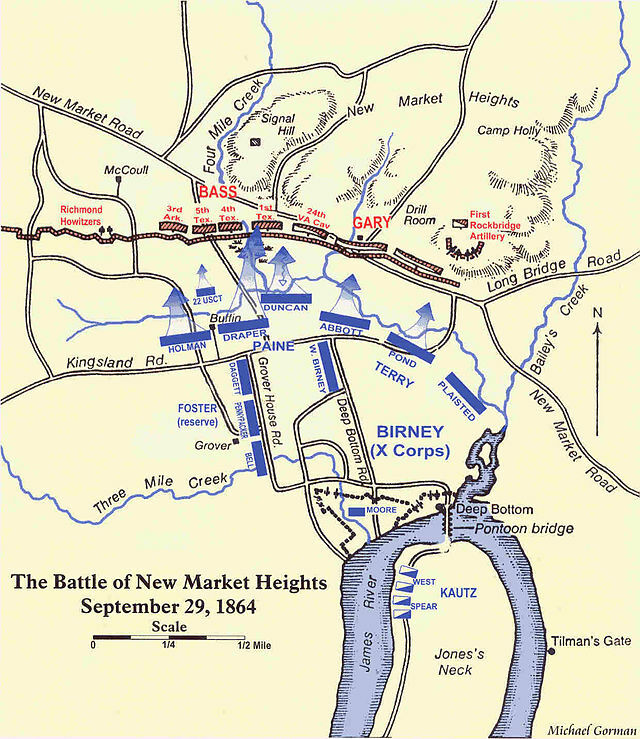 Birney’s troops to the right captured the enemy’s intrenched picket-lines, but were unsuccessful in their efforts upon the main line. Our troops fortified their new position, bringing Fort Harrison into the new line and extending it to the river. This brought us pretty close to the enemy on the north side of the James, and the two opposing lines maintained their relative positions to the close of the siege. In the afternoon a further attempt was made to advance, but it failed. Ord fell badly wounded, and had to be relieved ; the command devolved upon General Heckman, and later General Weitzel was assigned to the command of the 18th corps. During the night Lee reinforced his troops about Fort Gilmer, which was at the right of Fort Harrison, by eight additional brigades from Petersburg, and attempted to retake the works which we had captured by concentrating ten brigades against them. All their efforts failed, their attacks being all repulsed with very heavy loss. In one of these assaults upon us General Stannard, a gallant officer who was defending Fort Harrison, lost an arm. Our casualties during these operations amounted to 394 killed, 1,554 wounded and 324 missing. Whilst this was going on General Meade was instructed to keep up an appearance of moving troops to our extreme left. Parke and Warren were kept with two divisions, each under arms, ready to move leaving their enclosed batteries manned, with a scattering line on the other intrenchments. The object of this was to prevent reinforcements from going to the north side of the river. Meade was instructed to watch the enemy closely and, if Lee weakened his lines, to make an attack. After the fall of Altlanta, General John Bell Hood, commander of the Army of Tennessee, faced a quandry. He confronted an army led by Sherman that heavily outnumbered his force. Confederate manpower reserves were used up, and he could look for no further substantial reinforcements, while Sherman could rely upon an apparently inexhaustible flow of supplies and men from the North. If Hood remained on the defensive the initiative remained with Sherman who was clearly readying his army to plunge into the heart of the Confederacy. In these dire circumstances Hood hit upon the plan of heading north and forcing Sherman to follow him to protect his supply lines. This would perhaps forestall a futher advance by Sherman into the deep South and with luck allow the Confederates to retake Atlanta and other occupied territory. Something for the weekend. I feel a bit silly this morning, so we have I’ll Make a Man Out of You from Mulan via My Little Pony. 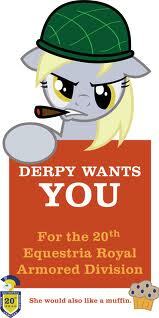 This of course is in line with My Little Pony Cavalry Commander. I finished watching Ken Burns, The Roosevelts: An Intimate History. A fair amount of liberal hagiography for FDR and, especially, Eleanor, but on the whole I liked it, and I will review it in a future post. However, I was struck by a vignette that occurred in the final episode. By 1944 FDR was in visibly failing health. Diagnosed with congestive heart failure, Dr. Howard Bruenn, a Navy Lieutenant Commander and cardiologist, followed him everywhere. He recommended extended bed rest which was an impossible diagnosis for a Commander-in-Chief during a World War. The start of a new series. In this set of posts we will take a look at truly foolish things said by people I generally admire. 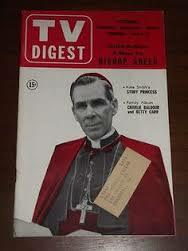 First up, this gem from Bishop Sheen. The idea that we chose to have the Soviet Union as an ally in the Second World War is a doozy. Hitler made the choice when he invaded the Soviet Union. If Bishop Sheen had then wanted us to be at war with both Nazi Germany and the Soviet Union, he would have had to have been content with Western casualty totals probably five times what they turned out to be, and his proposed course of action would have required the existence of Western leaders capable of explaining to puzzled populations why their nations were going to war with the Soviet Union that was holding down 80% of the Wehrmacht. Such a policy would probably have resulted in an eventual renewal of the alliance between the Soviet Union and Nazi Germany and led to a conflict that the Western Allies could not have won without resort to nuclear weapons, something that Bishop Sheen of course opposed. After his victory over Early at Fisher’s Hill, Sheridan decided that further pursuit of Early up the Valley would be pointless as Early’s force was too small to any longer pose a threat to Union control of the Shenandoah and his time would be better spent carrying out Grant’s wish expressed to General David Hunter that crows have to carry their own provisions over the Shenandoah Valley. 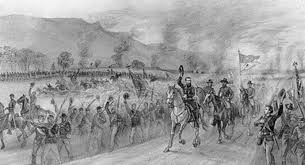 As Sheridan wrote to Grant: , “My judgment is that it would be best to terminate this campaign by the destruction of the crops, &c., in this valley, and the transfer of troops to the army operating against Richmond.” Grant agreed, and Sheridan over the next two weeks conducted a march from Stanton north to Strasburg, a distance of 70 miles with his army covering a width of thirty miles. After his defeat at the Third Battle of Winchester on September 19, 1864, go here to read about it, Early retired south to a strong position near Strasburg, Virignia, with his right anchored on the North Branch of the Shenandoah River, and his left on Fisher’s Hill, grandiloquently known during the Civil War as the Gibraltar of the Valley. The position was a very strong one, but with only 10,000 men to cover four miles, Early did not have enough troops to man it adequately. 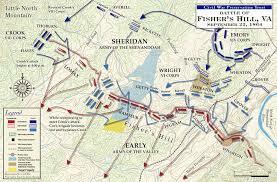 Sheridan with 29,000 men quickly decided that a frontal attack would be fruitless without a flank attack. Crook was sent with his corps on an arduous march to flank the Confederate left on Fisher’s Hill. Crook was in position to commence his attack at 4:00 PM on September 22, while Sheridan pressed Early from the front. 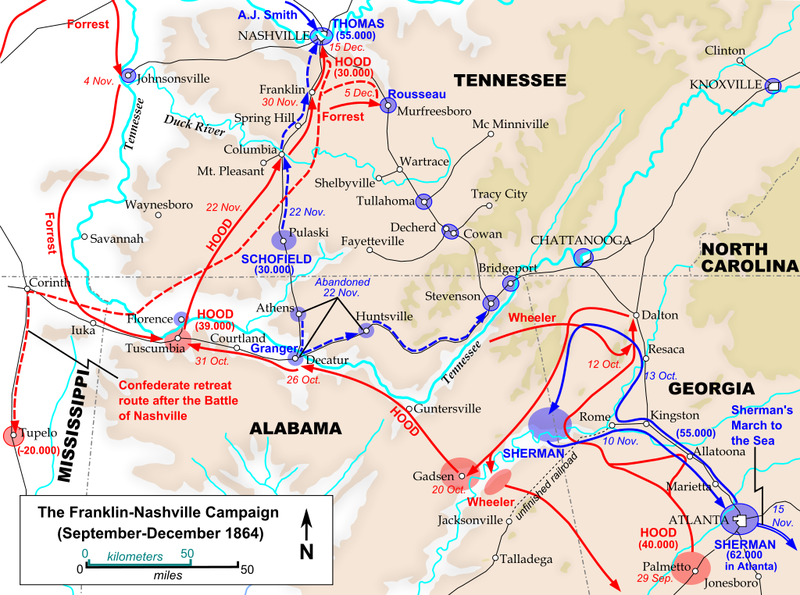 After some desultory fighting, the Confederate army routed. Battle losses in dead and wounded were minimal, but 1000 Confederates were taken prisoner. Early retreated to Waynesboro leaving Sheridan in undisputed control of the lower Valley, a control that Sheridan was going to use to destroy the granary of the Confederacy.